Visitors to Michigan's 71 wineries can taste the first wines from the 2009 vintage next spring. What they may not realize is that the grapes for those wines had a tough season on the vine. It was cold. It was wet. There was extreme cold in February and unexpected frost in early October. Not ideal growing conditions for wine grapes. Doug Welsch, with Fenn Valley Vineyards, says 2009 "will be remembered as one of the most difficult years to grow wine in the Northeast U.S. One significant bright spot was the four weeks of above-normal temperatures and sunny weather during late August and into September." According to Tom Zabadal, grape specialist with Michigan State University Extension, Michigan's wine grape crop endured the lowest number of "growing degree days" (days where the temperature is above a minimum threshold) in 14 years. Growers throughout the state held off on harvest as long as possible to get additional heat, and many removed clusters to allow the remaining grapes to ripen more fully. The good news, according to Welsch, is that "this was a stellar year for white wines. Early white varieties, including Pinot Grigio, Chardonnay and Riesling, have great fruit forward character and a pleasant acidity that makes the wine seem fresh and alive." Winemakers on Old Mission Peninsula also report that early whites have "lively acidity and show a refreshing fruit character." Matt Moersch, with Round Barn Winery, agrees. "Our early season thinning has really paid off. Even with the rain and cool temperatures, we are still pulling in nice, clean fruit. Quality wins over quantity this time around. Look for the Chardonnay to be a standout in the 2009 vintage!" But don't dismiss the reds just yet, says Joe Herman, with Karma Vista Vineyards. Although Herman says quantity is down, the reds show promise. "The juice from the reds is deep, almost inky; it's amazing with the weather we've had this season," he said. Michigan's wine industry continues to grow. Seven new wineries opened in 2009, bringing the total using predominantly Michigan-grown fruit to 71. Many wines from the 2009 vintage will be available beginning in spring 2010, though some reds may not be released for a year or two. Some wineries will celebrate the vintage with new-release and other special tastings. 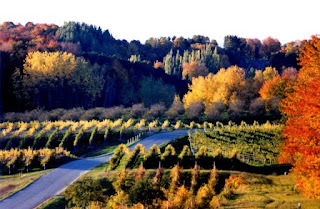 To learn more about the vineyards and wineries of Michigan, visit http://www.michiganwines.com/ or contact the Michigan Grape and Wine Industry Council at 517-241-4468. The Michigan Grape and Wine Industry Council is an 11-member panel that supports the growth of the grape and wine industry in Michigan. It is housed in the Michigan Department of Agriculture, which is the official state agency charged with serving, promoting and protecting the food, agriculture and agricultural economic interests of the people of the state of Michigan.